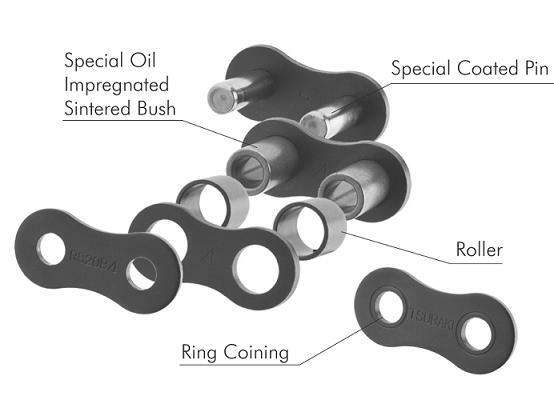 Tsubaki's Lambda Chains were the first in the industry to use a special oil-impregnated bush. Since their launch in 1988, they have been adopted for diverse industries and applications, and their performance has been highly rated. Tsubaki has a wide line-up of lube-free, long life products that help customers reduce costs. The 6th generation of Tsubaki Lambda Lube Free chain is supplied as standard with NSF-H1 food grade lubricant impregnated bush. 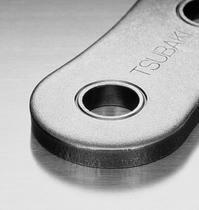 This makes Tsubaki Lambda Chain series perfectly suitable for applications in the food industry. Bushes impregnated with H3 certified lubricating oil are available on request. BS Lambda chain can be disassembled quick and safely with an original Tsubaki Chain Tool without damaging the bushes (RS08B-LM-1 to RS16B-LM-1). Breakage of the chains connecting link is no issue at Tsubaki thanks to this unique feature. By applying the patented Ring Coining process, Tsubaki generates a cold deformation around the pin hole of the connecting link plate. This results in residual stress around the pin hole and thereby adds strength. By using this process transmission capacity is 100% of the base chain. Tsubaki Lambda has outstanding performance in temperatures up to 150°C. For temperatures above 150°C Tsubaki has a special high-temperature Lambda available. Please contact Tsubaki for more detailed information. When an application needs water wash downs or is exposed to moisture, and lubrication is not possible or desirable, Lambda Neptune™ is most efficient. No expensive labour costs as it is not required to manually lubricate this chain. Lower frequency of purchasing due to the high quality of the chain and it's long economic life. No purchasing of lubricants or lubrication systems necessary. No unforeseen downtime due to chain breakdown. Less time required for maintenance and therefore more time for production. Applications run clean thus reducing the risk of contaminating products, machines, floor etc. BS Lambda: BS Lambda Chains are fully interchangeable with standard BS roller chains. ANSI Lambda: Only simplex ANSI Lambda is interchangeable with standard ANSI roller chain. However, as the pins are longer than those of the standard ANSI roller chain, please make sure that there is no interference with the machine. BS Lambda: Standard BS roller chain sprockets can be used. However, due to the extended lifetime of BS Lambda chain, Tsubaki recommends to install sprockets with hardened teeth in every Lambda application. ANSI Lambda: Only simplex ANSI roller chain sprockets are interchangeable. Multi strand sprockets need to be customised due to the thickness of the roller link plates. Due to the extended lifetime of ANSI Lambda chain, Tsubaki advises to install sprockets with hardened teeth in every Lambda application.